PHILADELPHIA, Pennsylvania, September 4, 2014 (ENS) – American and Argentine scientists have discovered and described an enormous new dinosaur species with the most complete skeleton of its type ever found. 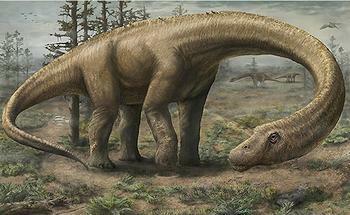 Dreadnoughtus schrani lived roughly 77 million years ago in a temperate forest at the southern tip of South America. At 85 feet long and weighing about 65 tons in life, the plant-eating Dreadnoughtus schrani had a body as big as a house and weighed more than a dozen African elephants, the scientists said. 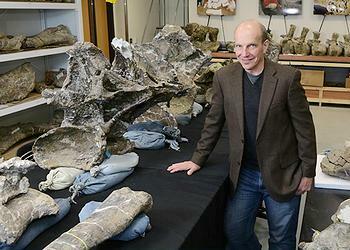 “Dreadnoughtus schrani was astoundingly huge,” said Kenneth Lacovara, an associate professor in Drexel University’s College of Arts and Sciences, who discovered the Dreadnoughtus fossil skeleton in southern Patagonia in Argentina and led the excavation and analysis. Its skeleton is exceptionally complete, with over 70 percent of the bones represented, but not the head. Scientists found most of the vertebrae from the 30-foot-long tail, a neck vertebra with a diameter of over a yard, scapula, numerous ribs, toes, a claw, a small section of jaw and a single tooth, and nearly all the bones from both forelimbs and hindlimbs. A smaller individual with a less-complete skeleton was also unearthed at the same site. Because all previously discovered super-massive dinosaurs are known only from fragmentary remains, Dreadnoughtus enables an unprecedented insight into the anatomy and biomechanics of the largest animals to ever walk the Earth, the scientists said. “I think it’s time the herbivores get their due for being the toughest creatures in an environment,” he said. The species name, “schrani,” was chosen in honor of American entrepreneur Adam Schran, who provided support for the research. The new dinosaur belongs to a group of large plant eaters known as titanosaurs. The fossil was unearthed over four field seasons from 2005 through 2009 by Lacovara and a team including Lucio Ibiricu of the Centro Nacional Patagonico in Chubut, Argentina; the Carnegie Museum of Natural History’s Matthew Lamanna, and Jason Poole of the Academy of Natural Sciences of Drexel University, as well as many current and former Drexel students and other collaborators. “The quality of this specimen has allowed us to study this new species in numerous aspects giving us closer to a holistic view than is possible for most dinosaur species,” said Kristyn Voegele, a doctoral candidate in Lacovara’s lab at Drexel. “This could only be accomplished by collaborating with multiple experts, and without this collaboration our knowledge of this taxon would be fragmentary and not live up to the completeness and quality of the specimen,” she said. Under Argentinian law, the Dreadnoughtus fossils are the property of the federal government in Argentina and are to be kept permanently in the province where they were discovered, Santa Cruz. The fossils were transported to Philadelphia and Pittsburgh in 2009 for scientific preparation and analysis under a research loan agreement. Fossil preparation and analysis occurred at Drexel University, the Academy of Natural Sciences of Drexel University and Carnegie Museum of Natural History. All Dreadnoughtus fossils are currently at Drexel University and will be returned to their permanent repository at the Museo Padre Molina in Rio Gallegos, Argentina, in 2015.